Drawing 3 with Prof. Jerry Lyles ! It sounds exciting as he plans on outside excursions all semester … we will draw some of the hidden places on this campus. Later I am to meet with Prof. Karen Sanders and get a studio key and have a room of my own! However … it develops that her plane from the east is delayed by Hurricane Irene and Prof. Donna Sweigert meets us and tells us we all have to share a studio. Disappointment! My share-mate is Adrianna Salecedo and she has been using the studio all summer. She is not present tonight … can’t meet her. I open the door hesitantly and … it is SMALL … and filled with her pottery equipment already … I must squeeze in somehow …. Guess I will paint her ceramic sculpture … which is curious and may make a unique painting! Tomorrow !! T for TEXAS! We have arrived in 106 degree heat !! and have wilted ! … like limp lettuce … went to the campus and signed up for Student ID and toured the four floors of the Library (AWESOME !) and then found out that the Graduate Art Orientation was postponed until Sept.3rd …. no studios yet available … Classes begin on Monday, the 29th … so back to our RV park to float on the pool. Not another soul in sight and the palm trees rustling and swaying in a stiff breeze. Having been told that there has not been a drop of rain for 10 months, I watered the grapefruit trees which surround The Winter Palace before I went to the pool. Half an hour later the puffy, white clouds assumed a threatening gray and thunder rolled … and sheets of lovely, cool rain hit the water of the pool … each drop hit with a pop ! ! ! little exclamation points all over the place. Why read Marcel Duchamp when the sky is putting on the ultimate show ? 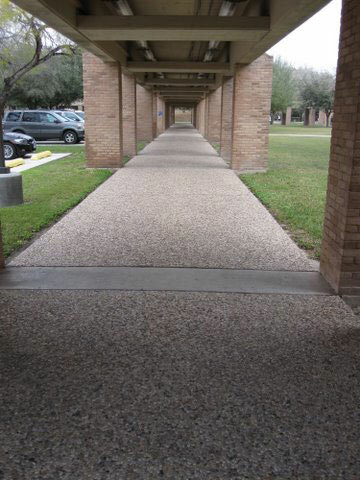 The UTPA campus is beautifully adapted to the surrounding environment. The intense summer heat is partly defeated by the covered walkways between buildings. Landscaping is geared to native, drought resistant plants and trees. 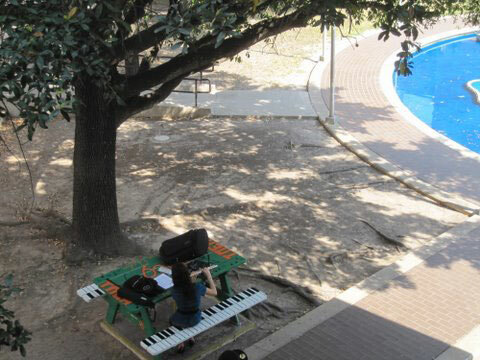 The table in the courtyard has been painted with a piano keyboard where this young woman plays the flute. Quite inspiring to walk up and hear tubas, horns, etc. tootling along … lots of smiles ! 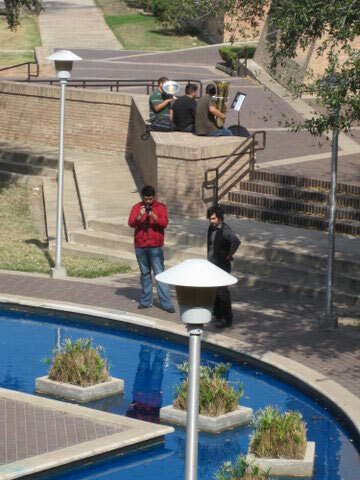 My fellow artists are serious about this program ….they are “UTPA Professionals ” and proud of it! It is wonderful to see the enthusiasm displayed by these future art professionals. I am looking forward to hearing their ideas and goals …. go, go, go UTPA Broncs ! A treasure trove! Passing thru Arizona/New Mexico there is a place where the art of past ages can be seen … and admired. Over 500 years ago a person sat down … and then created! Is this shape an inherited, traditional shape? Someone decided on the patterns of the jars and baskets … generation after generation the pattern evolved … reflecting the countryside in which a life was lived. Sitting on the steps, with a “Free – Take Me” sign, was a basket of squash and beans from the garden of the Amerind Foundation … the magical spot where thousands of artifacts have been collected and displayed for your pleasure. I am amazed! When I drove thru here in December the landscape was parched … brown … sere. Now, in the 105 degree heat of August it is GREEN … due to the summer rain storms … the flash flood time when towering clouds mutter with thunder and then drop a downpour. These poppies are even called “summer poppies”, or Arizona poppies. They are different from California poppies …flatter and taller … and they are scattered everywhere. The Black-vented Oriole !! 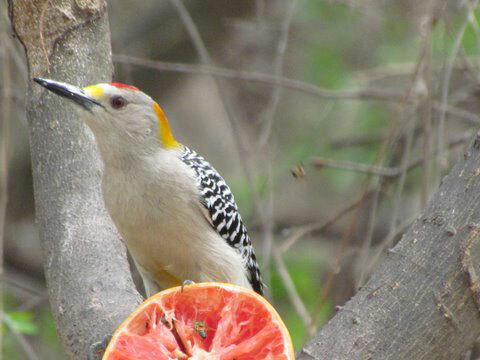 Texas has several kinds of oriole … they come up from Mexico to build their nests. The Black-vented is unusual for the Rio Grande Valley. It is my hope to see him once more this autumn/winter. The coral bean tree he feeds on will be in bloom in winter. Celebrate the nectar! Celebrate the color of the bloom! Celebrate the swooping swiftness of his flight … as he alights in the early morning to sing! to sing!